Art galleries and cafes. 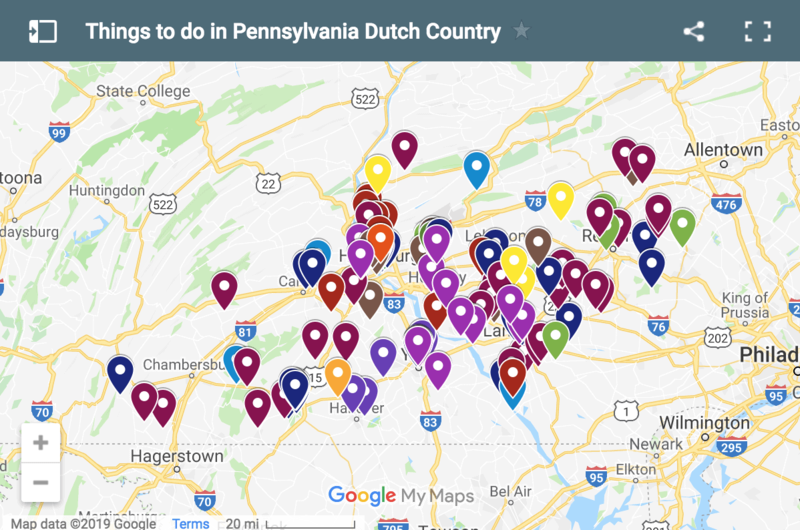 When tourists ask me for suggestions of things to do in Lancaster, PA, those artistic and culinary destinations immediately come to mind. 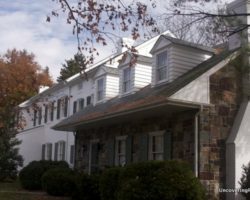 In fact, I recently wrote about my favorite art galleries in Lancaster. 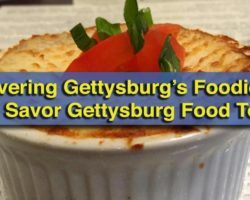 While first-time visitors may look toward the Amish community and Lancaster Central Market, natives such as myself have come to appreciate the county’s burgeoning art and food scenes. 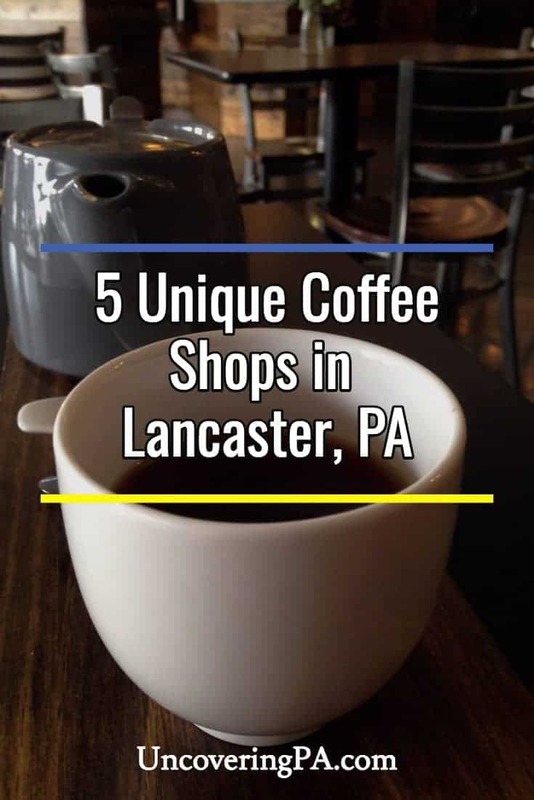 Lancaster’s local coffee shops offer a unique blend of the two. And there’s no shortage of cafe options. 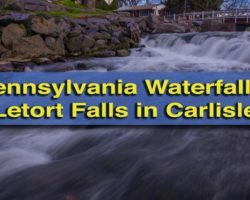 From downtown Lancaster to its suburbs of Strasburg, Elizabethtown, and Quarryville, cafes small and large cover the agricultural region. As one member of the cafe-going population, I have visited just about every establishment in the county that serves coffee and offers free wifi. Mean Cup cafe is clearly visible off Harrisburg Avenue and offers free parking. Mean Cup cafe is located in the northern end of downtown Lancaster near Franklin & Marshall College. This location makes it a hotspot for business people, students, and entrepreneurs alike. Mean Cup sets itself apart with a more industrial, big city environment than most of the other cafes in Lancaster. High ceilings and stainless steel fixtures complement authentic brick and wood elements that make Lancaster, Lancaster. This cafe focuses mainly in the beverage department, with a variety of hot and cold coffee and tea options. Their plain dark roast is one of the less acidic coffees options in Lancaster, PA. Light fare such as baked goods and sandwiches from another Lancaster establishment, The Goodie Shop, are also available. In addition to the high energy atmosphere and tasty menu offerings, Mean Cup’s free parking round this cafe out as a great destination. Whether you’re looking for a place to linger for a couple hours with a friend and a laptop, or you just need a cup of joe on the road, Mean Cup will not disappoint. 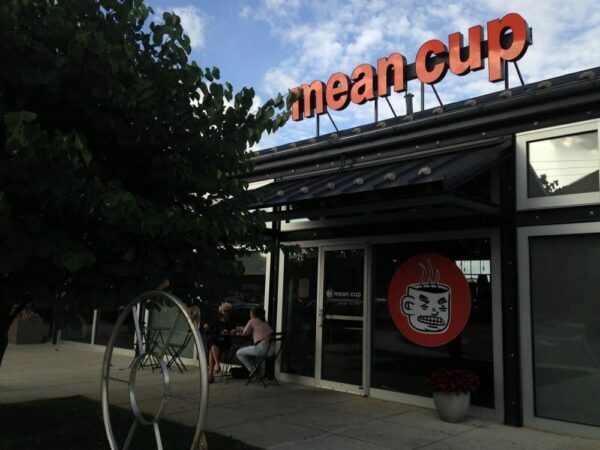 For more information on this lively cafe, check out our full article on Mean Cup. Passenger Coffee makes the most of their small space on West King Street with a simple yet attractive design. Passenger Coffee’s new downtown cafe offers specialty-grade products, a peaceful atmosphere, and an opportunity to learn more about how coffee ends up in the hands of the customer. The coffee company ensures quality in its products by working closely with farmers and exporters to discover unique flavors and to encourage sustainable practices. The team at Passenger roast the beans themselves to bring out its natural qualities and hand pour the grounds to produce a truly elegant beverage. While Passenger is clearly passionate about its product, the atmosphere at the cafe is welcoming. The meticulous coffee process becomes a source of conversation with the general public, rather than a reason for pretension. Passenger Coffee’s location in the center of Lancaster City make it one of the county’s smallest cafes. However, a minimalistic design, relaxed pace, and skillful yet friendly staff make this cafe a deliciously educational destination. For more information on this mission-focused cafe, read our full article about Passenger Coffee. Prince Street Cafe resides in the heart and hub of downtown Lancaster. Prince Street Cafe is the go-to destination for local cafe lovers. From graying patrons sipping on their specialty cups of joe to teens giggling over pastries, this coffee shop is about more than just coffee. While Prince Street is one of the more mainstream cafe options, its popularity is well deserved. This cafe and its employees know their purpose and how they fit into the mosaic of Lancaster County coffee shops. With typical cafe fare, my favorite of which is their African Peanut Soup, and unlimited refills of house brew from Passenger Coffee, Prince Street does not disappoint. The cafe space is large but fills quickly, especially immediately before or after a showing at Fulton Theatre across the street. The simple interior design complements and highlights the local art featured on the cafe’s walls and shelves. 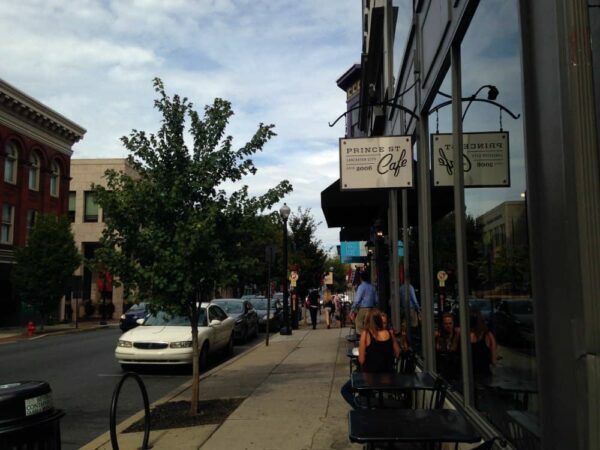 Grab a seat at the windows overlooking Prince Street or hide away in the benches in a back corner — either way you’ll get a taste of Lancaster coffee shops that will have you coming back for more. For more information on this cafe mainstay, go to Prince Street Cafe’s website. Copper Cup Coffee contributes to the Lancaster cafe scene with a unique space and drive thru option. On the outskirts of downtown Lancaster, Copper Cup Coffee sits on the fringes of the Lancaster County café norms. 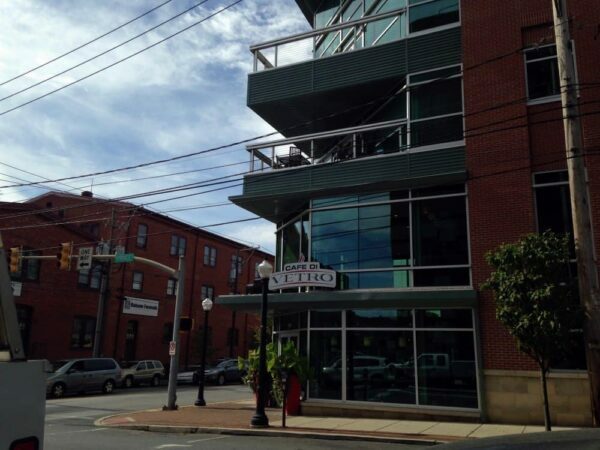 Many of Copper Cup’s characteristics align with those of other coffee shops in Lancaster, PA. The café serves locally roasted Passenger Coffee. The music playlist fills the open industrial space with acoustic melodies. Customers include independent workers alongside moms and their kids. 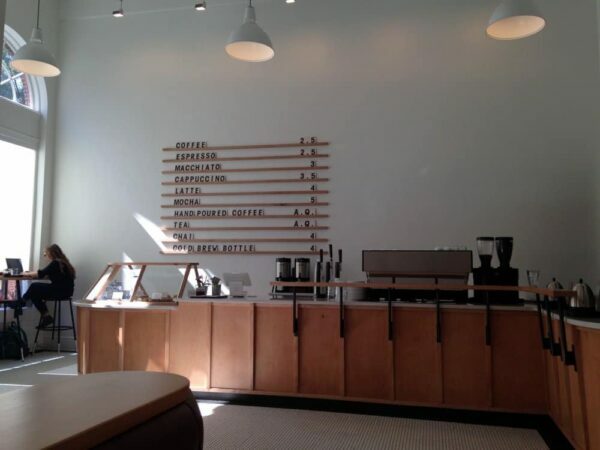 Friendly baristas make even the industrial space, a renovated bank, feel welcoming. However, one of the biggest ways Copper Cup strays from the standards of Lancaster cafes is a drive thru. This offering, an anomaly for non-franchised coffee shops in Lancaster, reduces the number of in-and-out customers. Customers who venture indoors stay for lengthy periods of time, many of which start with a specialty beverage but eventually succumb to a baked good. A variety of customers can enjoy Copper Cup Coffee in a variety of ways. 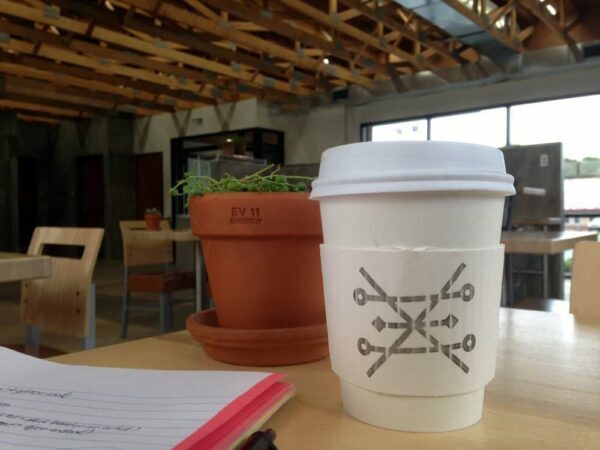 Grab a specialty cup of joe on the road or stay for a while to get some work done. 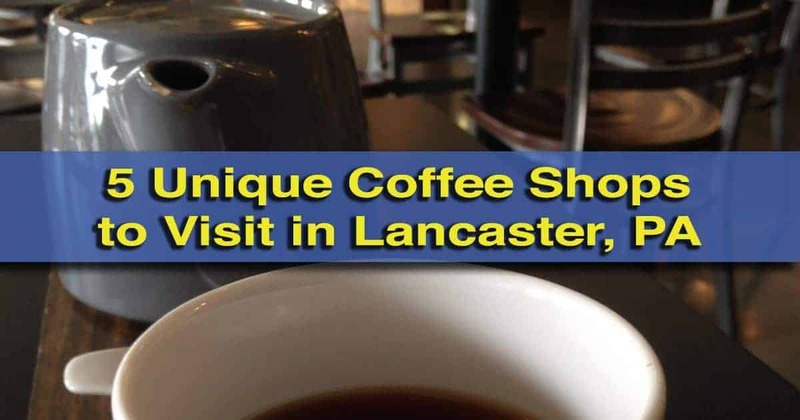 Either way, you’ll get a taste of Lancaster’s coffee. For more information on this innovative space, go to Copper Cup’s website. Cafe di Vetro’s two-storied height alone sets it apart in downtown Lancaster, PA.
Cafe di Vetro brings a big city appeal to the mini metropolis that is Lancaster City. Located in the northern section of the city, this cafe is not exactly walking distance from the center of town. However, with a free parking lot for customers just off Lemon Street to top it off, this cafe is worth a trip of its own. Take one step inside Cafe di Vetro and the glass tables, bright red stools, and second-story loft will make you wonder if you have been transported to Philadelphia or New York City. This coffee shop is one of the lesser known in downtown Lancaster, with an older and more business-like customer base. Cafe di Vetro’s menu includes signature beverages that tap into their desire to be an “Italian cafe and bistro.” Also, while many cafes offer comically large baked goods, I can personally vouch for the cafe’s huge chocolate muffins. From the bar stools offering the perfect people-watching perch to the collection of couches on the second floor, there’s not a bad seat in Cafe di Vetro’s house. For more information on this big city cafe, go to Cafe di Vetro’s website. Looking for other places to visit in the city? 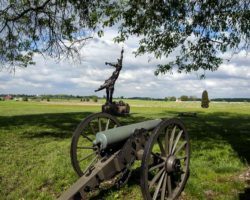 Check out our guide to the best art galleries in downtown Lancaster and our favorite Lancaster breweries. If you don’t mind driving a bit, Little Amps Coffee in Lancaster is another fantastic coffee shop worth visiting.